Portable ramps for wheelchairs are designed to be easy to move from one place to another, yet durable enough to be left in place. Made of lightweight, yet strong aluminum they a perfect portable handicapped ramp solution. The folding ramps are perfect for travel or general use, like steps, vehicles and more. 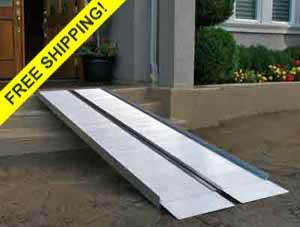 Shop for wheelchair ramps for stairs online today. Traverse ™ Loading Ramps Support up to 1000 lbs. from Express Ramps are designed to be lightweight without sacrificing durability. Our wheelchair ramps are easy to move from one place to another – simply fold the aluminum ramps and carry them to their new location (or take them off to storage, for the next time they’re needed). Once you’ve found a place for your portable handicapped ramp, install it and assure your peace of mind. Easy to place and easy to use, these ramps will change the way you navigate the entrances to buildings, vans, trucks, trailers, and more. Not only are our wheelchair ramps sturdy and easy to move, but they are made in America, with American Quality. Here at Express Ramps, we’re dedicated to solving our customers’ needs and providing them with a product that serves its purpose – while still meeting our high standards. 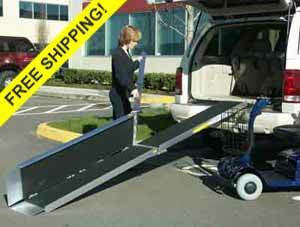 We have different portable handicapped ramps available for different situations. If you need a portable wheelchair ramp for stairs outside of your home or place of business, try our Advantage suitcase ramp. It extends 2 to 6 feet and is quick to transport and get in place. 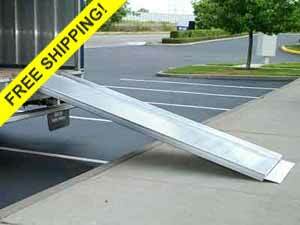 Maybe you’re looking a longer ramp for delivery trucks or loading docks. In that case, you may be interested in our Traverse™ portable loading ramp. We carry this product in 4, 6, 8, 10, 12, and 14 foot sizes. Although it’s sturdy (it supports up to 1000 lbs. ), it’s just as easy to transport as our other, smaller ramps. Whether you need a portable ramp for wheelchairs, scooters, or material handling, Express Ramps carries what you need. View our products and find the right one for your specific situation. 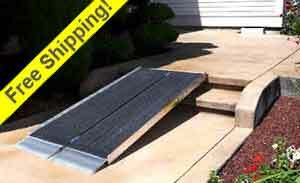 We are proud to provide a wide selection of handicap ramps for you to browse and order online.